I have never really been interested in dressage. I think there are lots of reasons why, but possibly the main reason being that I am very competitive and I have never really ridden a horse who would do that well at dressage. However, this has all started to change. He is naturally uphill and does have a certain amount of ‘spring’ in his movement. 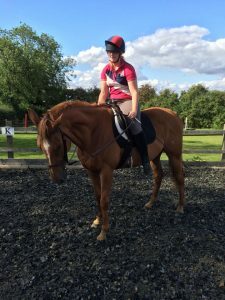 In the first week of having him and getting the saddler out, she complimented his movement in trot and several people have commented on his ‘spring’ while working in his pessoa and playing in the field. I was also surprised with our results and comments in our first dressage test. It was only an Intro test, but we scored 65% and the judge commented on his correct paces. All these things have sparked my competitive side and I’m really starting to think Scottie could do okay in some dressage classes. It’s going to be a while until we do anything other than Intro tests as we are still struggling with picking up our right canter lead. But I really am considering entering an Intro class each month just to help motivate me to keep working on us. And with the introduction of ex racehorse classes at E dressage, I feel we will be able to compete at least once a month.